Project Type: Website design and implementation using WordPress as a content management system (CMS). Heavy search engine optimization (SEO) work performed on all client supplied text. 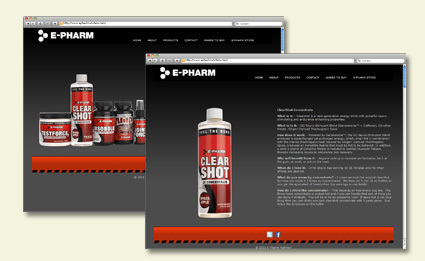 Project Description: As a leader in the sports supplement industry, Epharm Nutrition required a website that reflected that position. The contemporary design takes the minimalist approach to the design allowing the products and the in-depth product information to take the center stage. The entire site uses the WordPress platform as a content management system (CMS) to allow the client full control over all the content on their site. During the initial installation of the design, Six Demon Studio helped the client with search engine optimization (SEO) of their text and created guideline documentation on future text changes & additions performed by the client to keep the SEO consistent well after the project’s completion.